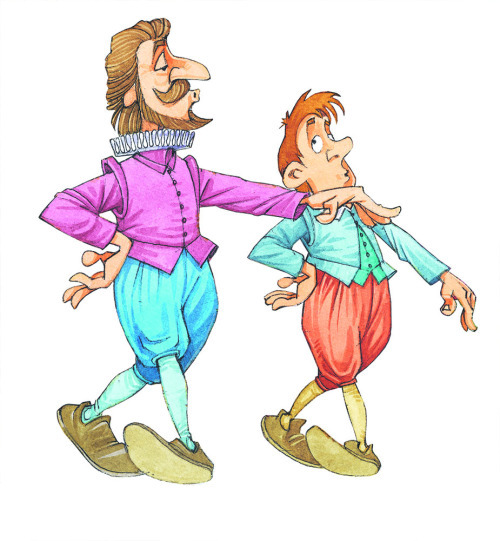 Based on a Key Stage 2 children’s history series You Wouldn’t Want To Be, these short plays can be downloaded from the site and performed in school. Back-in-the-day, schools couldn’t seem to get enough short wacky play scripts, comic sketches and daft melodramas packed with putrid puns (to say nothing of alliteration). Children could read them together in little groups, groan at the jokes and chuckle collectively. I used to write and edit such material unashamedly because I knew how even the most reluctant reader could enter comfortably the world of group reading, where silly one-liners delivered not just a giggle but also good-humoured peer approval. Since those days, when sniggering huddles of pupils at wet breaks in the library read together such titles as ‘Cowboys, Jelly and Custard’ (maybe not one of my finest literary works), I have been writing more standard fare for school libraries – albeit with a dash of silliness when I can get away with it. But I rue the day when sets of play scripts were packed away into that cupboard where so much tried and tested stuff ends up… and to which the key seems to be permanently lost. Publishers no longer seem interested in ‘funny short plays’ because there are now worthier priorities. But never fear… have I got news for you? Suddenly David Salariya beckoned out of the blue. “How about some comic play sketches to accompany our ever-popular history series You Wouldn’t Want To Be…?” Reading for fun was back. Halleluiah! It was my pleasure to read through this splendid history series and write a dozen play sketches, each for just six characters – all having short lines of dialogue for easy reading or performing. Yes, the plays are daft, but they also contain nuggets from the books and additional information about the period they illustrate. 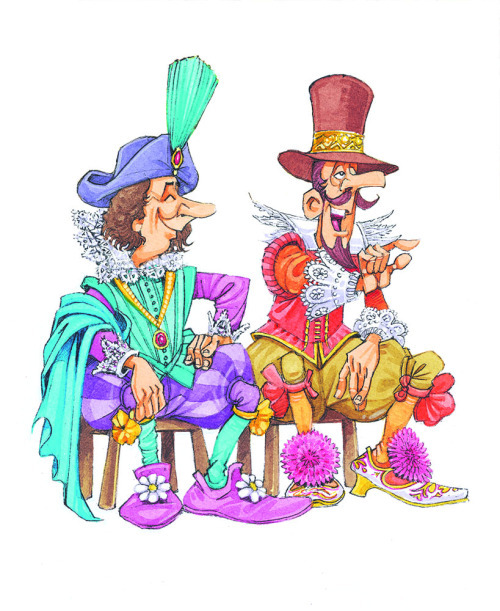 Apart from being awash with puns, wacky characters and crazy misunderstandings, the scripts range from pantomime to melodrama to farce and hip-hop. I couldn’t resist the occasional TV parody, either; Egyptian mummy-making a la ‘Master Chef’ or the ancient Roman game show ‘I’m a Gladiator… Get Me Out of Here’. Samuel: Good day, dear diary. It is very early on Sunday 2nd September. It smells as if Jane is already up and cooking something rather fiery. Elisabeth: You’re talking in your sleep, Samuel. Blow out the candle and return to bed. It is only three o’clock in the morning. What’s that smell? Samuel: I don’t think it is me, dearest. It must be the candle. Jane: (Calling at the door) Sir, madam… the sky over the city is red. Elisabeth: Unless the shepherd is on fire. Open the door in your night gown, Samuel. Samuel: But I don’t have a door in my night gown, dearest. OK – you get the gist. Just a bit of fun – but why not give the downloadable scripts a try? After all, such delights were all the rage back in the day… and we all know that ground-breaking retro is the new, bright tomorrow. Click here to visit the Fun & Free section of the Salariya website to find the plays and much more. Let me know how the plays go if you try them out. In the meantime, I might see you on my school visits this term when I may just tell you about my new novel coming out next year. So far, it’s a bit of a secret but anytime soon I’ll be spilling the beans about a scary mystery on the beach at the end of summer. Just when you thought it was safe to go for a paddle… Happy Autumn Term! 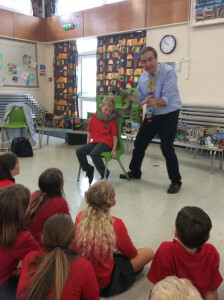 Today the children were given a real treat as they met the famous author John Townsend. John entertained them with tales from his own life and his inspiration for writing both fiction and non-fiction books. Some children were able to get involved with role play. There was much laughter throughout the whole session. This entry was posted in Uncategorised on 15th August 2016 by john.